The Nuna TAVO "2019" Stroller and Travel System is designed to seamlessly connect with the PIPA car seat with no adapters required, holding the TAVO true to its nickname of being a "One Click Wonder". The combined travel system with the TAVO stroller and PIPA car seat provides families all you need from birth onwards - a super functional stroller, a bassinet-like recline, and perhaps the most liked premium car seat available. stroller recommended use: up to 50 lbs. new combinations of the TAVO stroller with PIPA car seat that include the PIPA Lite and Lite LX, allowing you to save a little in the process! Transitions from a single stroller into a travel system with use of the Nuna PIPA Car Seat - no adapters required! True-flat recline, allowing use of the stroller from newborn stage and allowing your child to nap more comfortably during strolls even as they get older! The stroller is designed with four varying recline positions, adjustably with one hand. Roomy seat - the TAVO has roomy and spacious seating real estate for your child, and the seat even has more depth than other available strollers, allowing your child to stroll, stretch or nap in comfort. Recline/Upright. The stroller seat is designed with a multi-position recline that's great for naps, curious strolls, and positions in between. Spacious, oversized Sky smart™ canopy with built-in UPF 50+ protection from sun and elements. Nuna's signature Dream Drape™, built into the stroller's canopy, provides added coverage. Whether in upright or reclined positions, the canopy creates a cozy and comfortable environment for the child. Interchangeable Summer and All-Weather seat included, making the TAVO an ideal stroller for the seasons. Easily snap off the regular seat and enjoy a ventilated, breezy summer seat for the ride. Included infant insert provides extra comfort for your newborn. Simply remove the seat later for an even more spacious seat. Luxurious leather-like handlebar accents provide comfort for the parent, and adds an understated style element to the overall travel system. Telescoping Stroller Handle to accommodate parents and grandparents of varying heights, supporting proper back posture and a comfortable strolling position. Easy Fold with a cleverly-designed one-piece, one-hand open and close fold. Enjoy not having to carry the stroller as it's built to lightly trolley once folded! Spacious shopping basket. The TAVO's shopping bag is not only spacious, but easily reachable and accessible, with a built-in hidden zippered compartment for valuables. Spacious calf support and footrest. The TAVO sports a comfortably angled calf rest as part of its stroller seat, and a footrest built onto the frame of the stroller. Durable front and rear wheel suspension technology providing a light, smooth and comfortable ride for both child and parent. Built-in ventilation window for added air and breeze, also allowing you to take quick peeks at baby. Three or five-point harness with quick-click release buttons, and a slide height-adjustable mechanism. Removable arm bar for added safety, designed to fit children of all sizes. LEATHER-LIKE HANDLES. There is no question that the original TAVO was immensely beloved by customers for its versatility and functionality, but the brown leather-like handles definitely add the stylistic pazazz that this stroller needed. Whether you're combining the black Caviar TAVO or the classy Aspen TAVO with these handles, the contrast of the stroller's fabric of choice against these new handles makes for one stylish combination. TAVO BUNDLES with PIPA Lite/Lite LX. 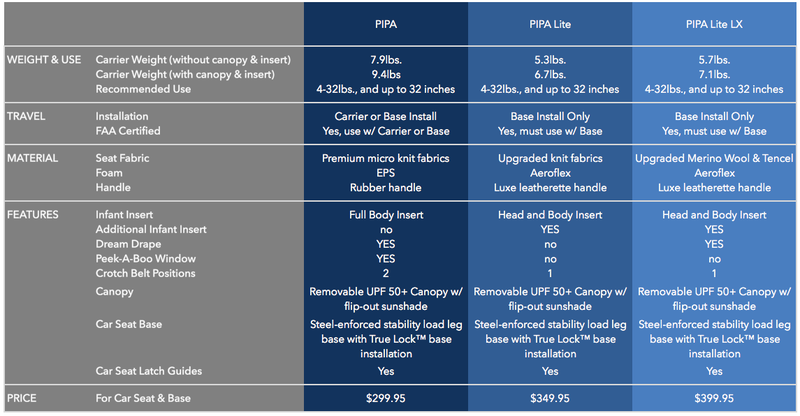 The PIPA Lite and PIPA Lite LX are perhaps the most dramatic change to the children's car seat market in quite a long time. Weighing in around 6 pounds, this line of car seats is revolutionary, helping to lighten the load for parents, grandparents and caretakers. In this TAVO release, there are three new TAVO bundles that allow you to save $50 when combining stroller and car seat: TAVO Aspen with PIPA Lite LX Aspen, TAVO Caviar with PIPA Lite Caviar, and TAVO Caviar with PIPA Lite LX Caviar. ALL-SEASON SEAT. The enhancements made into making the all-season seat more easily interchangeable make the TAVO more versatile, and more summer-friendly. With a few quick snaps, transition the stroller's main seat into a nicely ventilated, airy-breezy summer seat. The all-season seat is a nice feature in warm climates and when traveling. Excellent quality and outstanding customer service right at the beginning ! Location has a variety of quality products to check out! Couldn’t have gotten anything better than the experience we recicieved ! Extremely happy with our new stroller !! what do I say here? Lookslike a really good stroller and car seat. This was a gift for my daughter. I have not seen the actual item, only the video.